This was the original pioneering hydroponics technique. Although dated, it is still very popular among indoor horticulturists, mainly due to the inexpensive cost of setting up a NFT system, but also its simplicity. The principle is very easy to grasp. The plants are grown in a constant flow of nutrient enriched water. The water is spread out so as to flow in approximately 1-3mm of depth over a flat surface. This creates a film of water, which flows over the root system of the plant. This is not a rapid flow but enough of a flow that the water is in constant motion. Water is fed to the table via a submersible pump from the top end of the table. As the water is pumped in at one end of the table, it slowly makes its way to the bottom of the table where it then returns back to the reservoir in which the pump is submerged. So you get constant exchange of the water in the reservoir being pumped from one end of the table then returning to the reservoir via the other end of the table. The film of nutrient should always be maintained at around 1 to 3mm of water. The roots of the plant should grow below and above the water’s surface and that is why the film should be constant, allowing the water roots to develop below the water’s surface, and also allowing the air roots to grow above the water’s surface. The drawback of this system is that as the roots are constantly submerged in a film of water, this prohibits the aeration to the rootball, which in turn prohibits outrageous performance. To get over this problem, some NFT growers put the pumps on cycles, effectively flood and draining their NFT system. Other growers put air stones in the water reservoir and even under their plants on the NFT tables. Most NFT growers administer H202 to their tanks but at a very diluted ratio, however, this really needs to be done on a daily basis as diluted H2O2 breaks down very rapidly and over the course of 24 hours has completely dissolved its active ingredients. In using H2O2 in a daily capacity, this prohibits the use of organic growth promoters and other products that reduce the possibility of bacterial break out like pythium. The main disadvantage with NFT systems, especially in a grow room environment is the fact that pump failure is likely to strike at some point. The reason this tends to happen is that NFT systems are packaged with small flow rate pumps; cheap springs to mind but this is not technically fair. The plants only need a small delivery of water at a constant rate and the small pumps are all that can be used on a small NFT system. Now as the pump is perpetually on, the pump sees a lot of action over the course of its life. This coupled with the fact that you are then adding dissolved salts in the tank and in turn you are possibly in a hard water area, you get precipitation of the salts and the calcium that build up on and around the impeller of the pump. Once this impeller begins to attract precipitation, it is not long until it either gives up spinning completely or that it does not deliver enough water to satisfy the plants’ needs, resulting in crop failure. Pump failure can be overcome through regular cleaning and maintenance of the pump or indeed regular replacements of the pumps. As mentioned earlier, these are very inexpensive pumps and therefore can be regularly replaced without financial worry. Another downside with this technique is due to the fact that the roots are constantly submerged in water, so the plants are very prone to bacterial disease like pythium. Again, this can be overcome via regular dumping of the nutrient reservoir and adding products to the nutrient solution that have active ingredients that minimise the threat of root rot and moulds. The last drawback is that heavy yielding plants tend to fall over in a NFT system. This is due to the fact that the roots grow out flat and long giving the plants no stability. As they grow older and bigger you will need to support the fruits or flowers otherwise they simply topple over. Supporting them is easy using yo-yos, string, canes or some growers use a scroge. This is simply netting stretched out over the growing area. The plants then grow up through this netting which in turn helps support the plants. All of the above to one side, these systems are very productive and are an excellent inexpensive teaching aid to the principle of hydroponics. 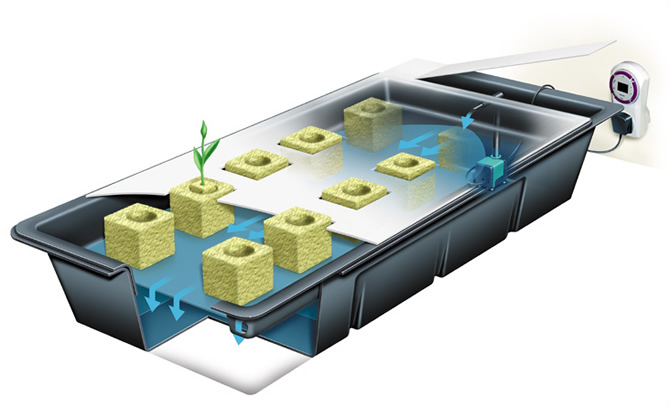 Also with this beautiful innovation the world of hydroponics might not be with us as this technique was the first adopted and used by many growers all over the planet, paving the way for our very own hydroponics revolution. One has to take one’s hat off to the British inventor that pioneered this technique. I mean, what made someone think: I know let’s grow plants in a soilless medium using nothing but a film of nutrient to do it in. Off the wall you could say!